This week we stay in Perú, where Aldo Watanave, with the Ministry of Culture shows us how they are documenting and sharing their heritage in 3D. My name is Aldo Watanave. I’m from Peru, in South America between Ecuador and Bolivia. I’m the head of the area of New Technologies at the Ministry of Culture of Peru. 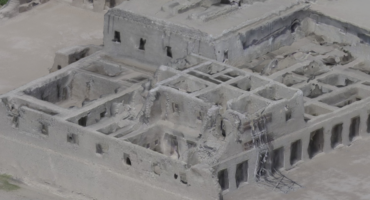 The principal objective of this area is to use drones (or UAVs) to record pictures, videos, and others features of all the archaeological and historical sites in Peru (Image 1). The area integrates archaeologists, engineers, and a topographer. We use DJI drones with a Sony Nex 7 camera to take pictures and videos (Image 2). Then we use Agisoft PhotoScan Pro to make 3D models. After that we use the information to create maps in ArcGIS. The New Technology Area team from the Ministry of Culture of Peru working at an archaeological site in Piura, north of Lima. In Peru there are around one hundred thousand archaeological and historical sites and nobody (not even the Ministry of Culture) knows what condition they are in currently. Additionally, every day in Peru one archaeological site is destroyed by mining companies, farmers, and other people. Due to this, the Ministry of Culture created our area. We think that the best way to protect and register our sites is through 3D models because it allows us to precisely gauge the current condition of the site and also prove that the site exists. Frontal view of the San José Church. This church from the time of the Peruvian Viceroyalty. It is the best example of Jesuit architecture in Peru and demonstrates some Baroque features. The major (every day) challenge is to try to teach our mission to the population near the sites. Those people live close to the archaeological sites and in many cases destroy them because they don’t understand what the sites mean. Now, with our registry, we can show them the importance of the sites through pictures, videos, etc. After that, we will gain new partners in the protection of our cultural heritage. This is why it is very important that they allow us to work to register the sites before our history disappears. Left side view of the San José Church.The church has been affected by many earthquakes, including those in 1756, 1786, 1942, 1949, and 2007. The Iglesia Virreinal San José (Image 3), is a church from the time of the Spanish conquest (around 272 years ago), when Peru was governed by the Spanish through a Viceroyalty. The Church is located in San Javier, Nasca (south of Lima, the capital of Peru). The church was inaugurated in 1744 by the missionaries of the Society of Jesus (Image 4). It´s very important because it is a very old building and helps us understand the history of this town (Image 5). For more information, you can visit our fan page on Facebook, our official account on YouTube and in our new webpage. To see more of the Ministry of Culture of Perú’s models here on Sketchfab, check out their profile!